Installing an AcryShield Roof Management (ARM) System, AcryPly Roof Restoration System, or AcryShield SPF Roofing System to renew or restore your aged BUR, Modified Bitumen or Asphalt roof will protect and prolong your roof without a costly tear-off. National Coatings’ AcryShield asphalt roof coating systems have been successfully used to repair and prolong the lifespan of Asphalt roofs since the early 1980's. The coatings used in these systems are specially designed to resist water infiltration, bleed through effects of exposed asphalt, and UV degradation. 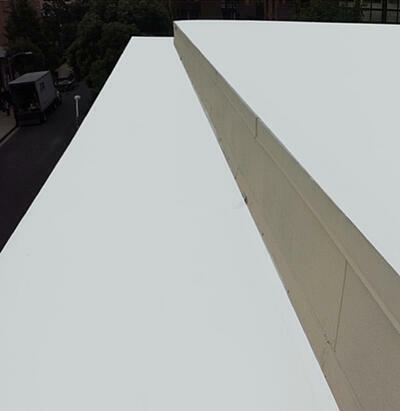 Our ARM, AcryPly and AcryShield SPF systems provide high reflectivity and emissivity allowing them to create a cool roof surface, which protects your roof from the rigors of the hot sun. These systems keep the inside of your building at a cooler, more comfortable temperature with less HVAC usage, ultimately lowering your energy cooling costs. Installing an asphalt roof coating system is done with little noise disruption to the tenants inside the building, allowing your business to remain open during application. These systems also contain either zero or almost no VOC contaminants or fumes during the process. The renewal and restoration process can be redone every 10 or so years allowing you to eliminate the need for a costly tear off indefinitely. 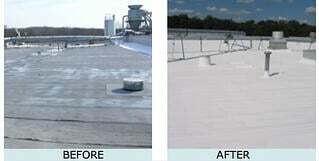 These asphalt roof coating systems create a truly sustainable solution for your aging and failing roof. To learn more, download our FREE Asphalt Roof Coating Guide or Contact us to find the ideal asphalt roof coating system and roofing products to meet your roofs specific needs! 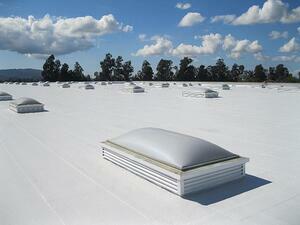 Asphaltic roofs with emulsion are excellent at waterproofing your roof membrane. 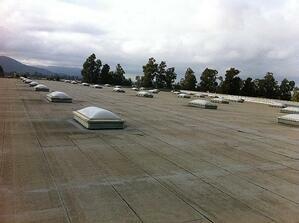 These roofs are applied across thousands of roofs in America and have been proven to be very successful. With all roofs, there comes a time when aging and failures begin to occur, at this time, we recommend apply an asphalt coating system to renew and restore these roofs, allowing you to avoid a costly tear-off. Asphalt roofing with emulsion can be difficult to adhere to because of its chemical make-up that gives it the ability to resist water; therefore, it is helpful to know a few ways to test how well the asphalt coating will adhere in order to insure proper and complete adhesion. (For new construction only) Make sure the asphalt emulsion is completely dried. The surface may feel dry but make sure beneath the surface where the asphalt meets the existing roof is dry. This may take a day or two. Other factors to consider are weather conditions. Heavy dew, fog, rain, humidity, etc… will cause the asphalt to dry at a slower rate. 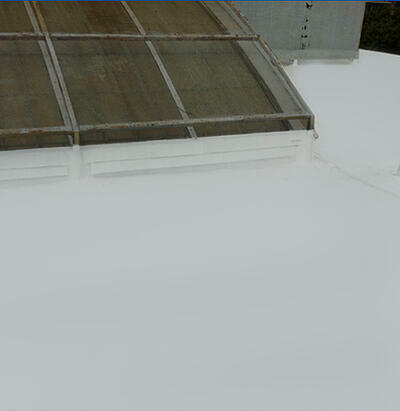 If the asphalt doesn’t get proper adhesion to the roof surface, you will have adhesion issues going forward. Many asphalt emulsions contain large amounts of emulsifiers and surfactants. These ingredients have a tendency to come to the surface and cause the rooftop to be soapy and slippery when wet. Test a small area by applying a few drops of water to the roof and rubbing around with your finger. If the water turns black and feels slippery, then you know your roof contains too much residual “soaps” for proper adhesion. A pressure washer is great at removing the soap from the rooftop but you need to make sure to flush all the water off of the roof without allowing it to collect and/or dry in ponded areas as adequate adhesion can not occur with the soap between the asphalt and the coating layers. Once all the soap is rinsed properly off the building, a simple spot test with water drops and your finger (as described above in #2) should be conducted again to ensure the pressure wash removed all the soapy materials. 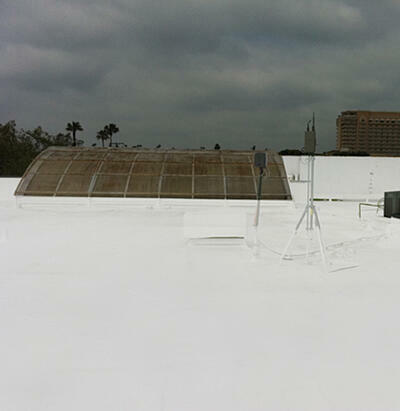 If the test shows soap again, another pressure wash of the entire roof surface is necessary. After the washing is complete and the spot test shows there is no more soap then a final field test is conducted on a dry asphalt surface. Take a piece of 1 inch masking tape about 5 to 6 inches long and press firmly onto the surface. Pull it back at a 180˚ angle. If the tape has satisfactory adhesion, then it will not peel away easily and will not contain dirt, degraded asphalt or other materials that would cause interference with proper adhesion. When you’ve completed the few steps above and are left with a clean piece of tape that had good adhesion to the asphalt surface, you are ready to apply the asphalt coating system knowing that proper adhesion will be achieved. Get more information on our asphalt coating systems. These systems can be applied on a new asphalt roof for added protection and energy savings, and on older systems for renewal and roof life extension.